The inside of this restaurant, located in Richport Town Centre on No. 3 Road between Lansdowne and Ackroyd, is fairly spacious. They seem to have larger tables and the decor looks a bit upper class but there is distracting noise that comes from the Skytrain located right outside. 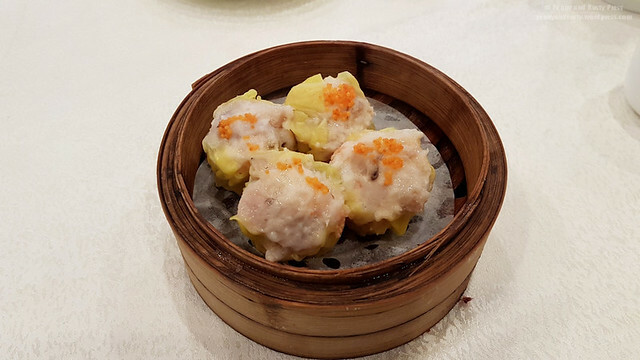 The steamed pork and shrimp siu mai with flying fish roe was okay but just okay. We also ordered the deep-fried taro and pork dumplings. 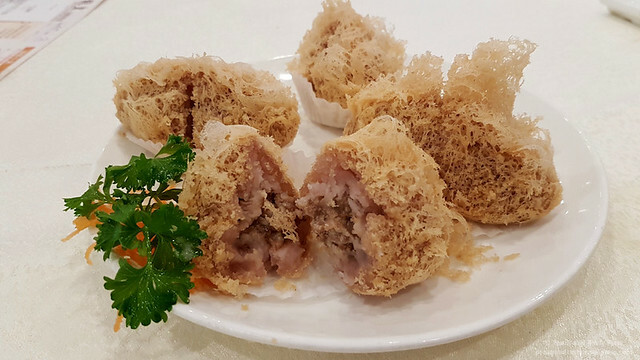 The exterior had a light, fluffy, coating from the fried taro but the interior filling was a bit drier than I prefer. The Chinese Donut Rice Roll had a crunchy Chinese donut on the inside. While I do enjoy how the texture of a crunchy Chinese donut plays off the smooth rice roll, I felt that it was almost too crunchy. 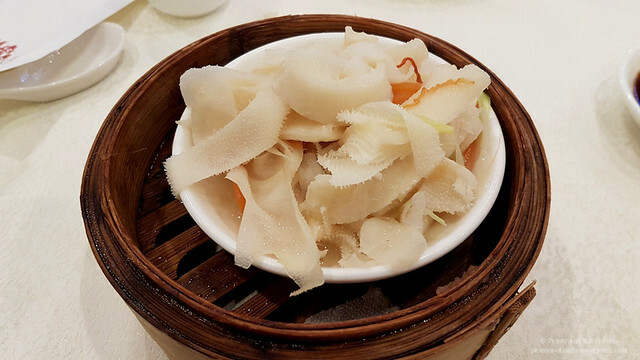 The tripe with ginger and green onion was strangely dry even though it was sitting in a broth. 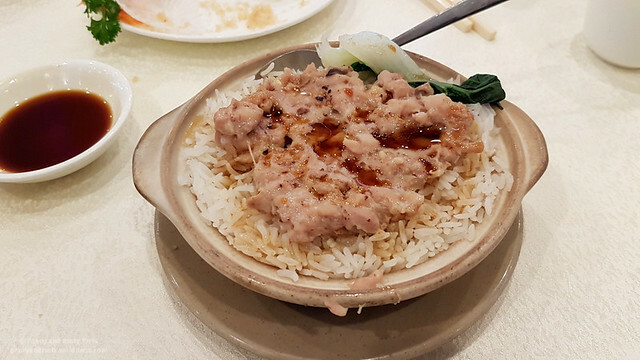 I wasn’t really sure what to expect of the diced chicken, squid, and mushroom hot pot but wanted to give it a try since it was one of the specials listed on the menu. It actually turned out pretty okay (kind of like ju yoke beng but with chicken instead of the ground up pork). 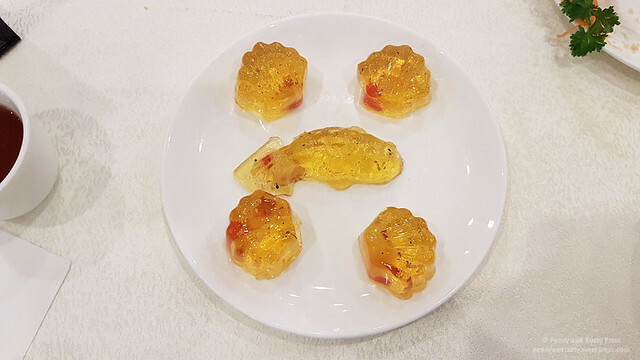 Lastly, we ordered the lychee and osmanthus jelly which surprisingly came in 5 individual molded pieces… a fish centred within a ring of 4 seashells. Overall, I found the dim sum dishes to be just average in terms of quality with many items tasting a bit too dry. We did get 20% off our meal because we early in the morning. 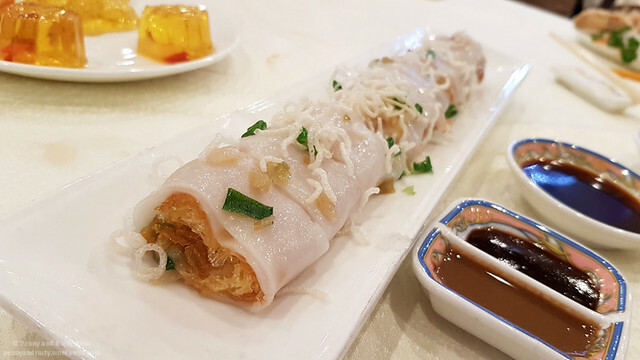 Posted on April 23, 2017, in Breakfast, Chinese, Dim Sum, Restaurant Review and tagged Breakfast, Central Richmond, Chinese, Chinese Donut Rice Roll, Deep Fried Taro Dumpling, Dim Sum, Food, Lychee and Osmanthus Jelly, restaurant review, Richmond, Siu Mai, Tripe. Bookmark the permalink. Leave a comment.